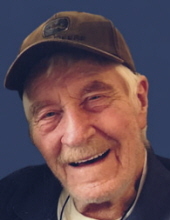 ALEXANDRIA, IN- William “Jim” Wilson, 93, passed away peacefully at Vermillion Place in Anderson on Wednesday, December 5, 2018. He was born on May 26, 1925 in rural Alexandria to Morris and Margaret (Laws) Wilson. He grew up on the family farm and loved being outdoors. Jim was a graduate of Alexandria High School-Class of 1943. He also attended Purdue University. Jim was retired from the Madison County Highway Department, and was well known in the area as an expert heavy equipment operator. He was a gentle soul who loved to tell a good story about growing up on the farm, or about some adventure he had as a young man. His warm smile and infectious ways will be missed by many. 4 Children-James Matthew Wilson, Darin LeAnne (Tim) Cox, Danielle Suzanne (Alan) Clashman and Hedi Lorraine Wilson. He was preceded in death by his parents, a brother-John Wilson and twin infant brothers. Services honoring Jim’s life and legacy will take place at 5 pm on Friday, December 7, 2018 in the Owens Funeral Home, 412 North Harrison Street, Alexandria with Pastor Jerry Young officiating. Cremation will follow the services. Friends may call at the Owens Funeral Home after 3 pm prior to the service. Owens Funeral Home is honored to care for Jim and once again serve the Wilson family. To send flowers or a remembrance gift to the family of William "Jim" Wilson, please visit our Tribute Store. "Email Address" would like to share the life celebration of William "Jim" Wilson. Click on the "link" to go to share a favorite memory or leave a condolence message for the family.